Growing concerns about a U.S. slowdown hit the Detroit automakers' stocks hard last month. Shares of Fiat Chrysler Automobiles (NYSE:FCAU) had it rough in December. The company's share price dropped 12.8% last month, according to the data mavens at S&P Global Market Intelligence. Fiat Chrysler's (FCA's) decline was in part driven by the broader market sell-off, of course. But its share price dropped further than the benchmark S&P 500 Index, on investor worries about the U.S. new-car market -- concerns that hit both of FCA's old Detroit rivals' stocks as well. As I mentioned above, FCA wasn't alone. 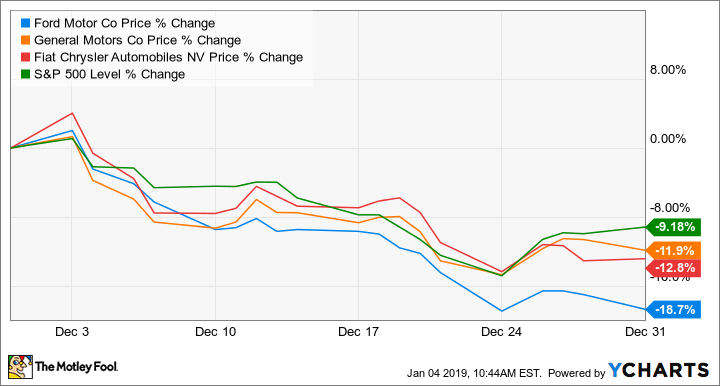 Both General Motors (NYSE:GM) and Ford Motor Company (NYSE:F) saw their shares slump more than 10% in December as well. Investor concerns about the potential for a significant slump in the U.S. new-vehicle market were sparked by GM's Nov. 26 announcement of a major restructuring effort. GM plans to idle five North American factories and cut nearly 15,000 jobs in a bid to boost cash flow. GM said it was getting out in front of a potential slowdown, and that got investors thinking: If GM, which has been quite profitable, feels that it has to make these cuts, then what's in store for Fiat Chrysler? Strong demand for the all-new 2019 Ram 1500 pickup helped FCA to an 8.4% sales gain in the U.S. last year. Image source: Fiat Chrysler Automobiles. FCA is unlikely to close a bunch of factories: Its North American plants are running at much higher capacity than the GM factories that are set to close, in part because FCA has already done the work of eliminating its mass-market sedan models and consolidating production. And while Ford and GM both posted declines in U.S. sales in 2018, FCA's were up 8.4% on good sales of Jeeps, pickups, and muscle cars -- all nicely profitable products. But investors are right to be concerned: When the U.S. new-vehicle market slumps -- and it will, sooner or later -- all three Detroit automakers will face profit squeezes. FCA will report its fourth-quarter and full-year 2018 financial results in a few weeks (it hasn't yet announced the date). I expect CEO Mike Manley will give a preview of what the company expects for 2019 at that time as well, which might -- or might not -- be reassuring for worried investors.